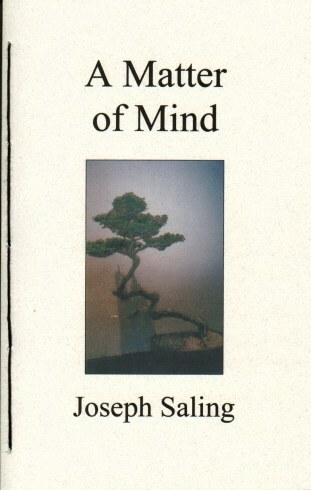 FootHills Publishing, Wheeler Hill, New York, is pleased to announce the release of "A Matter of Mind" by Joseph Saling. Joseph Saling makes his living as a freelance editor and writer and a professional communications consultant, specializing in health communications. For the past six years he has been the managing editor of On Call, a feature magazine for nurses and other allied health professionals. Educated at The Ohio State University where he studied creative writing with Robert Canzoneri, he taught college and served as the writing specialist at three different institutions (St. Anselm College in New Hampshire, Marshall University in West Virginia, and Massachusetts Bay Community College in Massachusetts) for more than twenty years before quitting to devote himself to developing his own writing career. His poetry has appeared widely in journals such as Poet Lore, The Formalist, Amherst Review, and Ball State University Forum. He has also served on the editorial board of several scholarly and literary publications, most recently as an assistant editor for the Birmingham Poetry Review. Although he calls New England home, he currently lives and works in Birmingham, Alabama. A Matter of Mind is his first volume of poetry. as I longed for their wings, wished to grow wings. who could catch the crow flapping above mowed fields. like the music of gulls rocked by the wind. caught in a web of meaningless melody.